There was some noise a little while back about a new race for 40K but it seemed more like wild speculation than anything substantive. So either this is just GW giving the Squat lovers at least a nod, or it's a precursor to a new push for Squats. 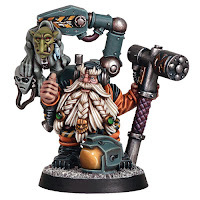 Without wiping out the established canon for them (Their homeworld was consumed by the 'Nids), I think it'd be a good move to have surviving Squats make for Tau space and join up with them ala' the Kroot and Vespids. I think they'd fit in nice there, though historically they have solid (if troubled)history with the Imperium, the humans already have enough factions rounding out their roster.